From This Side of the Pond: Let them eat cake! 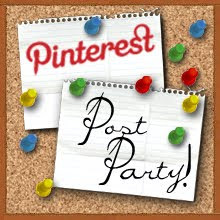 Joining the Pinterest Party hosted by Mindee over at Our Front Door today. I'm sharing a simple and delicious recipe I've made hundreds of times and while I know that's not exactly playing by the rules wouldn't you rather me post a recipe I know is tasty as opposed to one that is just a maybe? Actually this recipe pops up on Pinterest quite often but I'm pretty certain the credit should go to Bisquick. If you don't have a shortcake recipe you already love then I recommend you give this one a try. It's super easy, delicious, and I think, foolproof. The recipe says to sprinkle your berries with a little sugar. I like to cut mine up several hours ahead of serving so they have plenty of juice. Don't skip the sugar because you want the juice it creates. These shortcake biscuits are rustic and not overly sweet. Slice them in half and put a layer of berries in the middle. Pop the top back on and then add more berries, and of course a big dollop of real whipped cream. Yes, it must be real whipped cream. I loathe artificial whipped toppings. I made this for Memorial Day and tossed a few blueberries on the side too. I have to try this one since I have the low carb substitue called Carbquick! So easy and delicious. After yesterday's Hodgepodge giving me the hankering for strawberry shortcake, I'm definitely going to try this recipe. Sounds yummy - and looks easy enough. I needed a great go-to recipe for this AND it's the perfect season for it! Yay, Joyce! That looks so delicious - I'm definitely going to try it! You're right, it is a Bisquick recipe. I know this because I make it sometimes and the recipe is in my Bisquick cookbook. :) The good news for us- Bisquick comes in gluten free form now! WooHoo! I mke these but with low carb bisquick instead. They are my favorite dessert. Yum! Those are the best biscuits, Love 'em! You must've been reading my mind. I started thinking after the HP that I've never actually made shortcake. Thanks for posting, and yes, I much prefer a "foolproof" recipe as oppposed to a maybe! Although, with me, baking is never foolproof and always a maybe. i have made this before---thanks for reminding me!! Happy Summer... well, kinda. It's about 50 degrees out and rainy. I can't wait for the warmer temps again. This looks absolutely delish. I love bisquit made Strawberry Shortcake! Yummmmo! I haven't ever tried this, but I will have too. Looks wonderful! Strawberry shortcake is one of my favorite desserts. Biscuits have always intimidated me so I've never given them a try. You've inspired me with this simple yet delicious looking recipe. I'm with you on fresh whipped cream. There's just nothing that compares. Thanks, Joyce! Now that makes me want to reach through the computer and grab it :) I'm sure it's delicious. Bisquick shortcake is the BEST, and what my mother made too years ago....but try it just like you said, but in a bowl with some milk on it. That way is even better! Bisquick makes the BEST shortcake and that's what my mother used too, many years ago! We make it just as you say, but try it in a bowl with some milk over it....it's better yet! My family loves this recipe for shortcake. Nothing is quite like Bisquick!